Not hearing is not as good as hearing, hearing is not as good as seeing, seeing is not as good as knowing, knowing is not as good as acting; true learning continues until it is put into action. We generally hear many things from our parents, friends, colleagues and we forget. We see many things in day to day life and we do easily remember that things. When we actually do what we have understood easily. We had a plan for what we were going to do if and when we were ever laid off, and that plan including striking out on our own. We won’t really know what we’ll do until we are living it. It’s hard to know what we will do in a particular situation when the stakes are high and we have lots of people depending on us and our judgment and our motivation behind it. Learning and adapting is a natural human process it is all about the ways how people acquire skills. The great lesson of life that passes through the ears is heard, retained for a day’s time, and forgotten in sleep. The knowledge that passes through the eyes is seen, recalled for some time and forgotten by next time. But the great lesson that passes through the hands and body is understood by the heart that stays forever in our, soul mind and heart. And that will the starting of the change that you wish to see in the world. We hope guys you find Quote "I hear and I forget. I see and I remember. 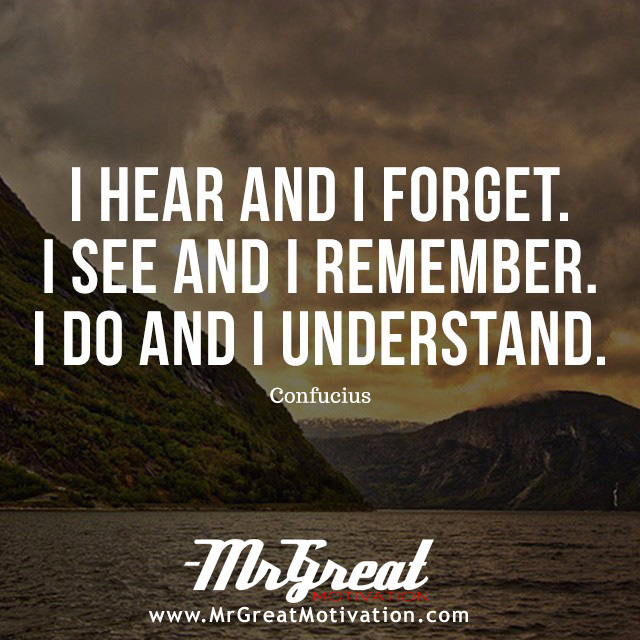 I do and I understand - Confucius " by Mr Great Motivations useful. If you think we have made some efforts, then don't forgot to appreciate us by sharing this Quote with your friends and family, And thanks for visiting.